I’ve been hibernating, it is winter. The Man in the Shed bought me a hot water bottle, chiefly to stop me from whinging and putting my cold feet on him. 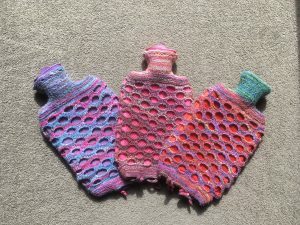 (The title of this post is a quote from a song by Flanders and Swann which features a hot water bottle and people with cold feet so I thought it was fitting.) The smalls promptly nicked it so we sent him back to the shop for two more and I get brownie points for using up some of my stash to make some covers. 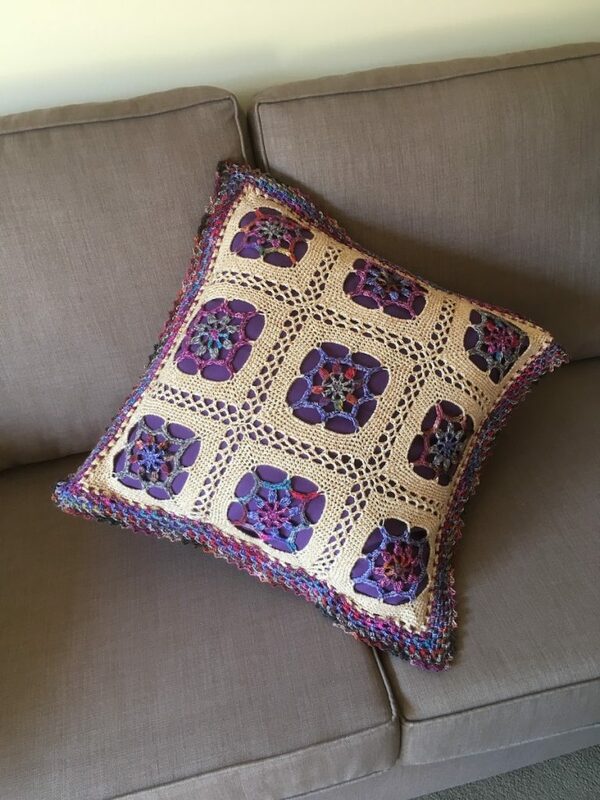 The pattern is by Lucy Neatby who has written a book of holey stuff. Putting off sewing on lots of scout badges and eventually sewing them on this week. Making a new Joey for Mathilda because she lost hers somewhere along the way and I thought she looked a bit sad without him. 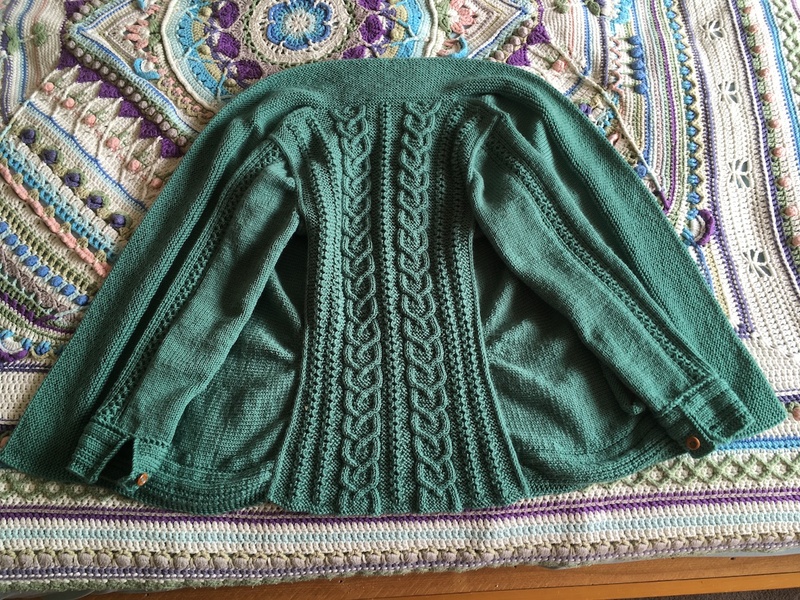 I did use a pattern but I can’t remember which one and I changed it a lot because it wasn’t really the right size or shape to match Mathilda. I made a couple of these pop up cards just for fun to see if it worked. Hopefully there is an only-ever-so-slightly-wobbly video filmed by Small if I can figure out how to put it in the post. I made some more bookmarks to put away for Christmas, I think they have forgotten about them now. Ooh, and I did some other super secret Christmas stuff that I can’t show you yet until after Mikulás has visited but it was lots of fun to make. 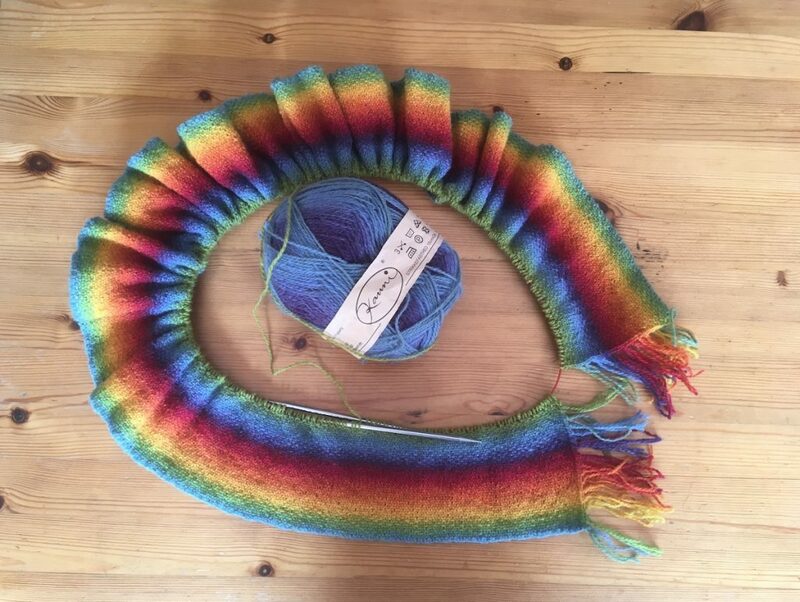 I finally thought of something to do with this yarn, it is a really slow colour gradient, I bought some to make a baby blanket (the baby is 3 ½ now) and I bought an extra ball for me because I loved the colours so much but then I couldn’t think what to make with it. 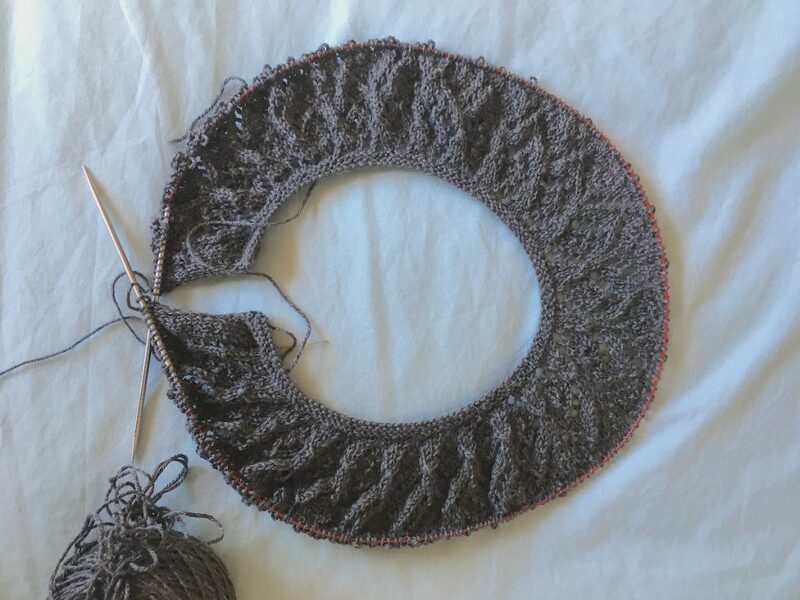 This is a linen stitch scarf – the front looks almost woven and the back is a bit like seed stitch. 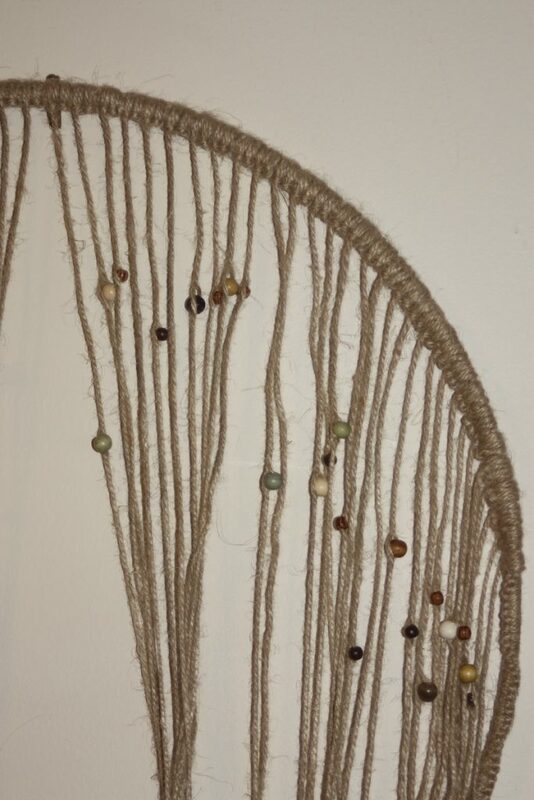 I’m really pleased with how it is turning out although I suspect it might be a bit itchy. I found the end of a ball from the blanket so that I didn’t have to start with yellow (I don’t know why, just didn’t want to have yellow on the edge), it almost joined up so there is just a slight discontinuity between the yellow and the green. There is a worse one between the red and the purple because my ball of yarn had a join in the middle which I didn’t know about until I got there but I don’t think it is too bad. I’m just over halfway through, there is one more repeat of the colours up to blue again. Oh yes, nearly forgot – things to be thankful for number …hmm… don’t know where I got up to: we are more than halfway through our time away so it is downhill from here (downhill in the sense of getting easier rather than downhill in the sense of getting worse). That is probably cheating because choosing a thing that is about going home doesn’t really count as a thing that is good about being here. Let’s try again – things to be thankful for number whatever it was: wallabies are brilliant – we went to the wildlife park in the school holidays and you could feed the kangaroos and the wallabies. The kangaroos couldn’t care less but the wallabies were acting like they hadn’t been fed for three months and they would hold your hand to get at the food better, it was lovely, they are really soft like cats and they have really warm paws. I definitely need to give my cats quadruple cuddles when we get home, I’ve got some catching up to do. Things to be thankful for number three: There are only two and a half days left of the longest ever term and so far we have all survived. Just about… Ok, maybe not the longest ever, somebody was telling me the other day that they used to have three terms instead of four so they had thirteen week terms sometimes, so doubly thankful that it wasn’t as long as that. This week I have mostly been making little bits and pieces and putting off doing boring grey sleeves. 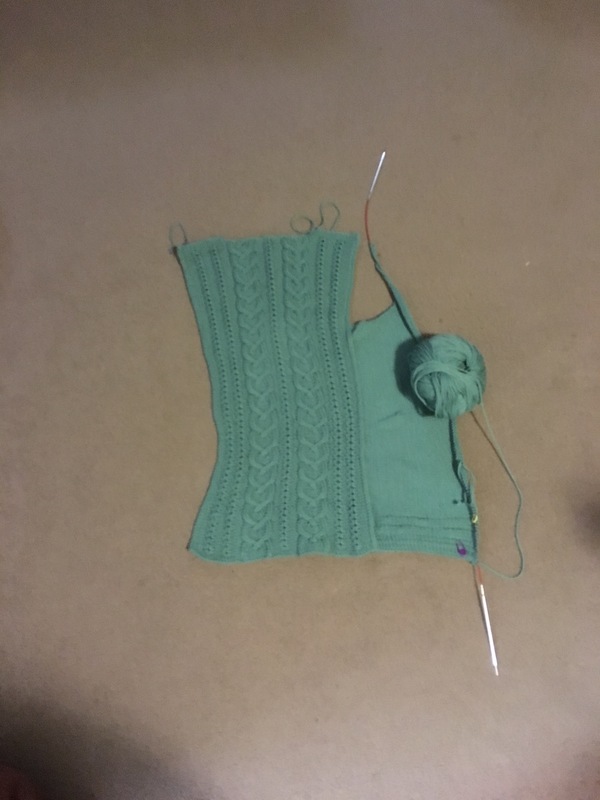 The sleeves are making slow but steady progress but are not really photo worthy yet (there is only two thirds of one sleeve so it isn’t very exciting). The little bits and pieces are mostly for the small people’s camp blankets. They have been accumulating badges from Wales and here which have been sitting in my sewing box for months so I thought I should really do something with them. I said I would make them their name out of crochet and sew it on and then some bright spark asked if they could have semaphore instead or maritime flags so that their name was in code and I got a bit carried away and said they could have their name at the top, the flags down one side and the semaphore down the other side but thankfully he said that wasn’t what he meant and could he have his name in code and use all the alphabets together. So this is what we came up with between us. You can have some points if you can work out what the slightly wonky animals are too. 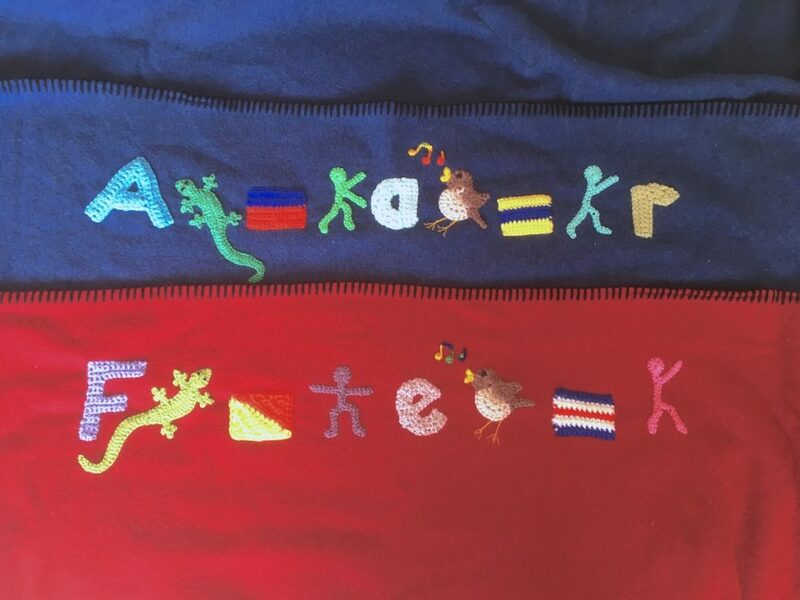 I made up the semaphore men and the flag patterns, (that O was a real nuisance to get right!) the letters and the bird were from Moogly and the green creature was from here. I was feeling brave or possibly foolhardy at the weekend and even taught Small to use the sewing machine to sew his Welsh scarf on to the blanket, he had a practice on one of the Man in the Shed’s hankies and decided he was a bit crooked so when we did the scarf I did the steering and he did the pedal. I still have all my fingers so he has been declared semi-competent at sewing-machining, he just needs to learn how to thread a needle and to practice his steering. He was pretty good with the seam ripper too so his next job is to cut all the badges off his old Beaver uniform so that we can put those on as well. 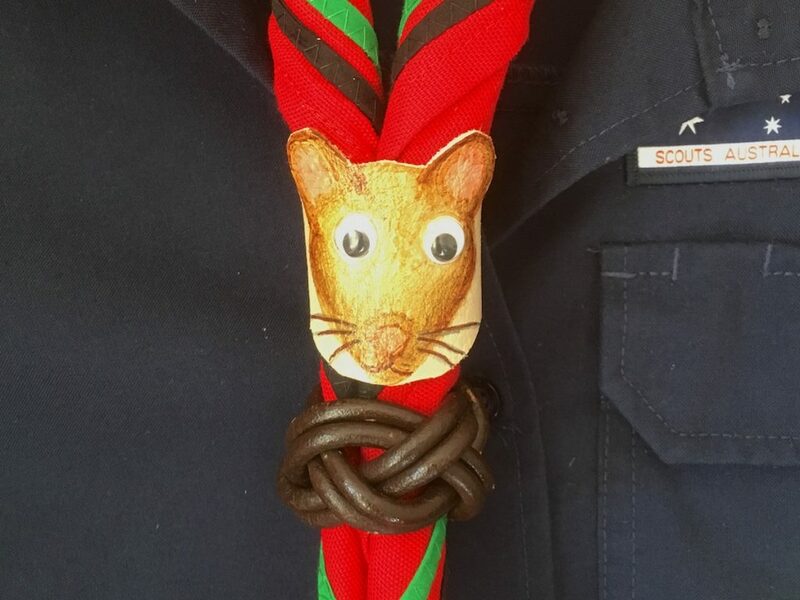 Also on the subject of Scouts, slightly wonky animals and little things are a couple of woggles. We made wolf woggles at a Joey fun day (but I did a mouse one because I like to be awkward) out of leather, goggly eyes and permanent marker. Mine was very wonky and it was bugging me so when I got home I cleaned off the pen with nail polish remover and did it again. I have more different colour pens at home too. It still looks a bit wonky but less so. I think the ears still need to be bigger and the goggly eyes make it look a bit shocked but it’s good enough. Well, I thought it was until I got mistaken for Possum! My friend Rosella liked it and said she ought to have a rosella one so I had a go at crocheting one for her. Hers is a bit wonky too but good enough. Here is a picture of a real rosella for people who don’t know what they look like. I did do another one first where I used two strands of yarn together which meant I could blend the colours together a bit better where it changes by swapping one strand over a couple of stitches before the other one and I think it was a better shape too but it was too big for a woggle and I would have gone insane sewing all the ends in, this one had far too many as it was! The other little things I have been making are bookmarks, when we were looking up animal patterns I found Supergurumi and was immediately faced with demands for multiple squashed animal bookmarks. 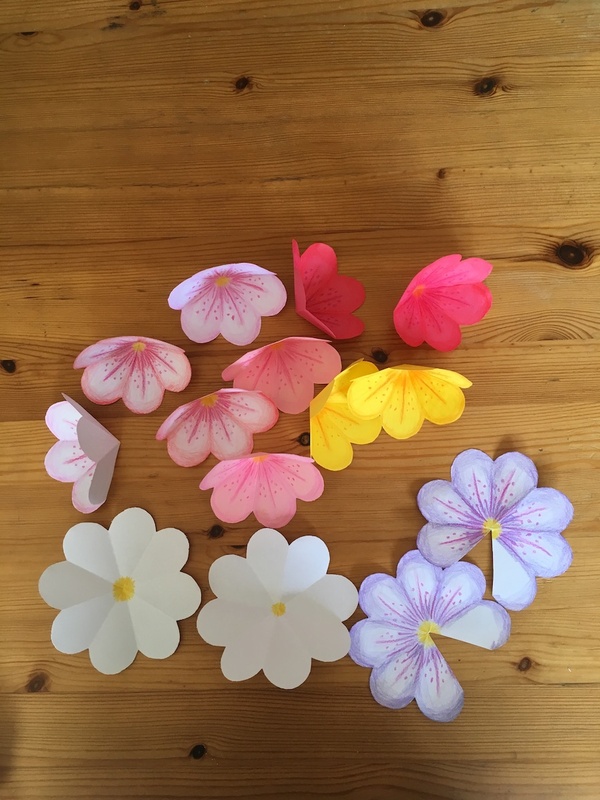 The small people have got one each so far which is keeping them happy for now but I am very tempted to make some more just because the idea of them tickles me. I was brought up on Cicely Mary Barker’s flower fairies and later on had a copy of ‘Lady Cottington’s Pressed Fairy Book’ which is very funny (although it’s a bit rude – definitely not a children’s book, they are very naughty fairies…) and the squished animals reminded me of those, I have always had a fairly dark sense of humour starting with Roald Dahl and then Lemony Snicket and I can sing most of Sondheim’s Sweeney Todd and most of Tom Lehrer’s songs without batting an eyelid at the lyrics. Anyway, here are a fox and a gecko to be going on with, they don’t seem to be faring any the worse for all their squishedness. I thought it must be about time to write a post, we seem to have been very busy the last few weeks but when I tried to remember what we have done I’m struggling to have come up with anything to write about, it has all been very ordinary things but there have been a lot of them. I’ve got an earworm of the song now, I only know the chorus really, I just looked up the rest of it and I like the line, ‘I must rehearse the songbirds, To see that they sing in key.’ I’ll have to learn the rest of it next time I have nothing to do. Tiny was sick a couple of weeks ago. A week after that the Man in the Shed took Small and Tiny off on family camp with the Scouts, I still haven’t managed to remove all the mud from the strange places it has found its way into. I got out of camp by going on a training weekend for Joey Scout leaders (Joeys are the equivalent of Beavers in the UK) and it felt very odd to have a night to myself with nobody else in the house but I did enjoy the quiet. 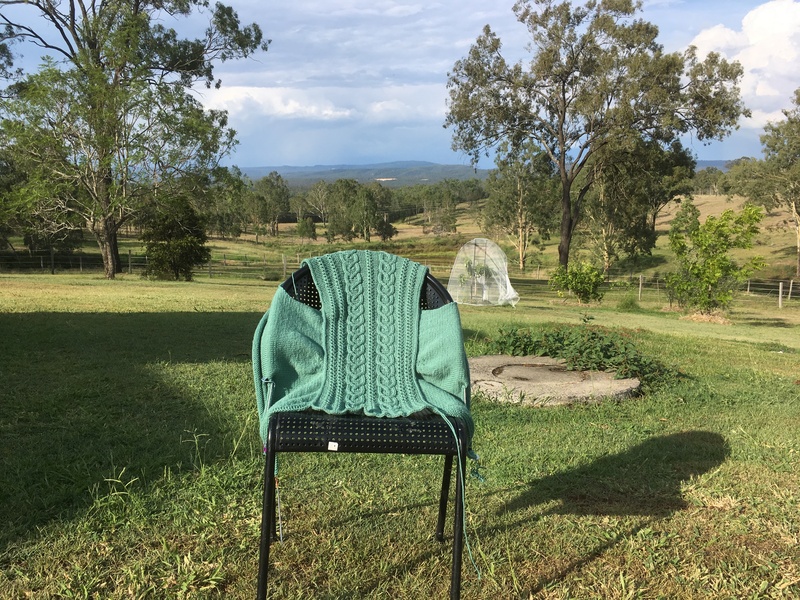 This week, when home was being hit by a bout of freezing weather just when it should be warming up, we got hit by a 39°C day just when I was getting used to it being in the 20s again and my body said, ‘No, too hot!’ and promptly sent me to sleep on the sofa all afternoon. I got all my squares joined together, it didn’t take as long as I thought it might. I had to hold the yarn in my left hand to make the join work because you had to keep the working yarn under the bits you were joining and I usually hold it in my right hand, (I was going to say I hold it the wrong way but then I decided it isn’t wrong, just different and it works perfectly well most of the time) so I had the option of putting the yarn round to the underneath after every stitch or holding it in my other hand. The first couple of squares were slow going but once I had done a few it was quicker. 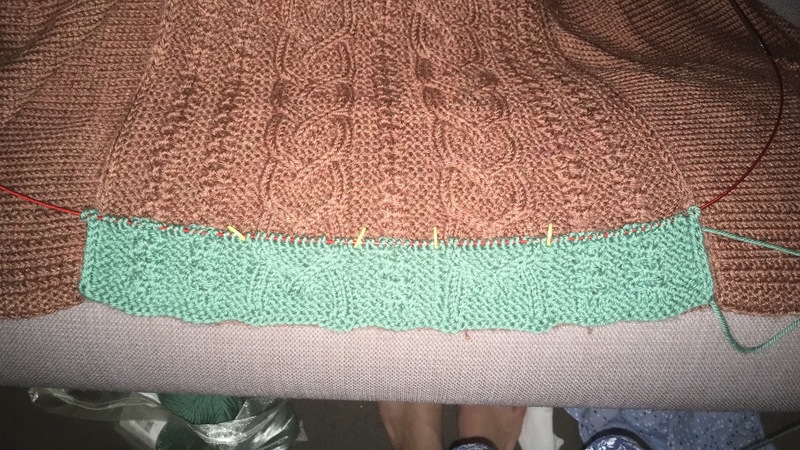 The border wasn’t very interesting to do, most of the rounds have a spike stitch every fourth stitch which messed up my rhythm and slowed me down a little and the last round has 1408 stitches so it was a bit of a slog but I really like the way it looks. 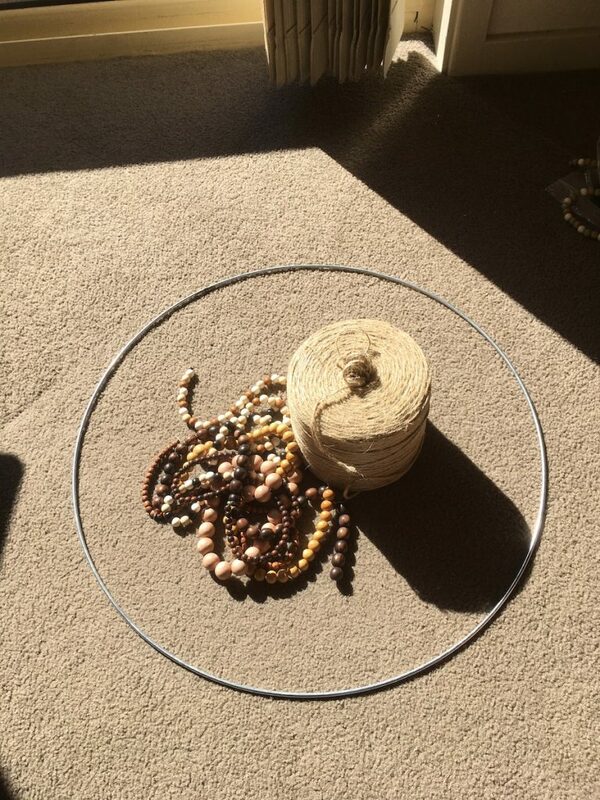 It fits nicely on the bed too but if I took a photo if it there then I would have to tidy up the rest of the room for you so here it is on the floor. You can click on the photo if you want to make it bigger. 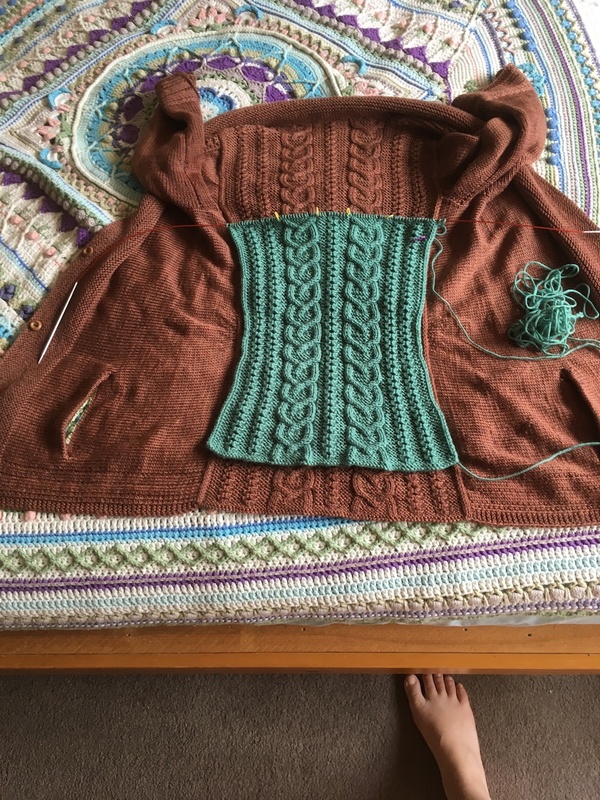 The pretty cardigan with the pockets is coming along nicely. 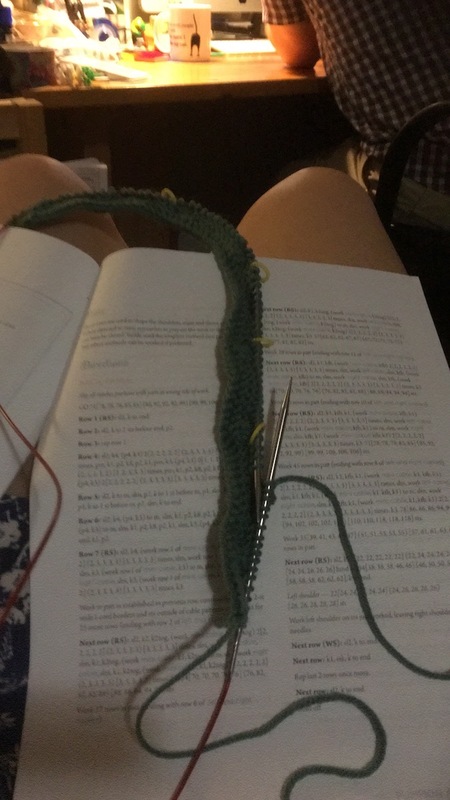 I got to the end of the body and because it is stocking stitch all the way down with an i-cord cast off it is a bit curly at the moment, I am really hoping that once it is blocked it won’t curl up so much but I am not sure. Maybe I’ll have to weigh down the pockets with all my pocket detritus, that ought to do the job. 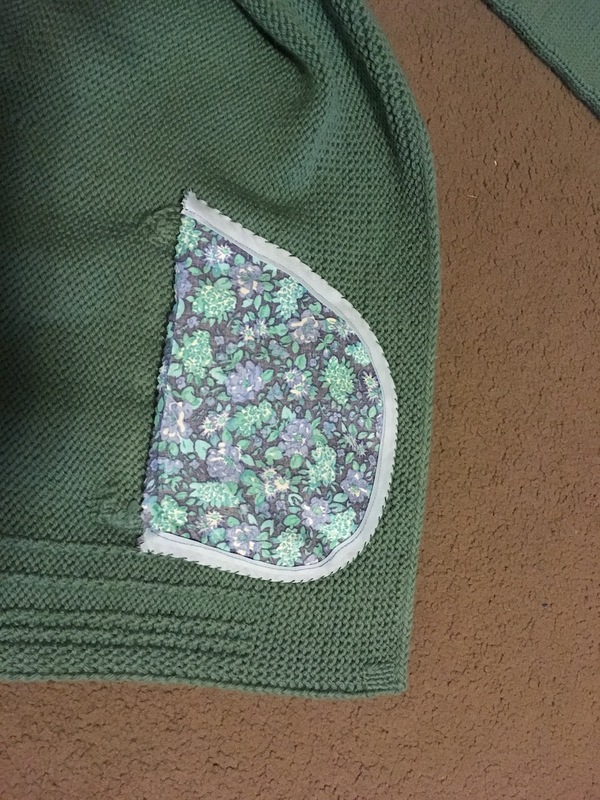 The pockets made a lot of ends to sew in because you have to cut and rejoin the yarn in various places and I thought I would sew those ends in before I start the sleeves so instead of doing that I got distracted making a secret thing for Tiny’s birthday. The pattern matches her blanket but it is in different colours, here is how far I have got with it so far. 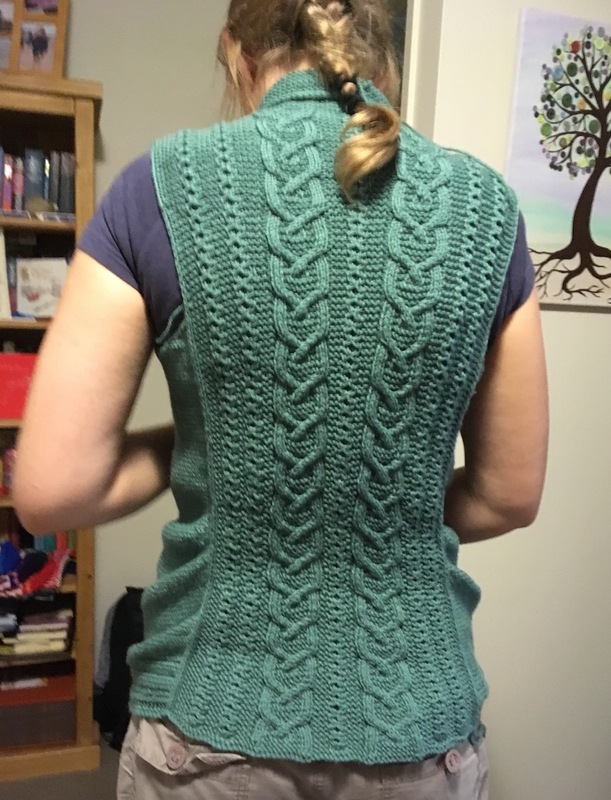 I had to redo the back because I did the number of rows in the pattern and it was humongous (is that how you spell that? 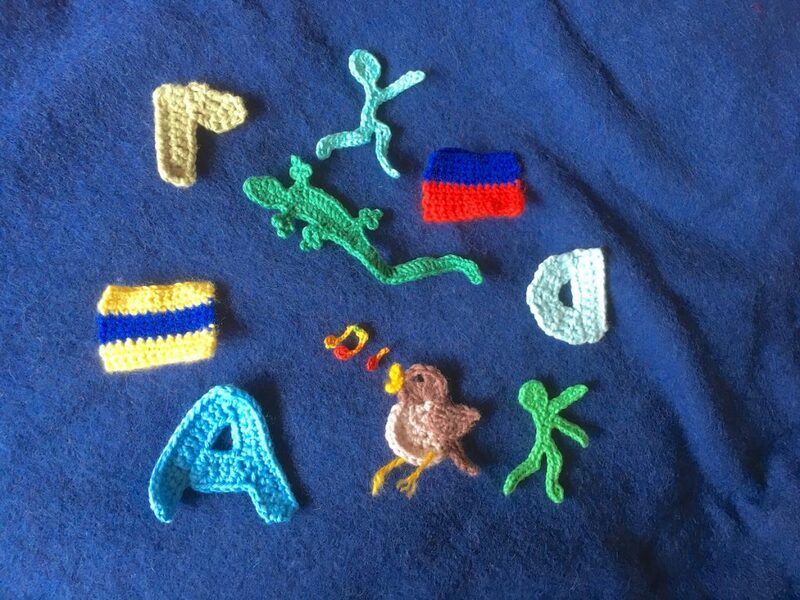 It doesn’t look right whatever letters I put) and when I checked the size of the squares for the front from the blanket I realised there was no way they would ever fit together and I unravelled a load of it and redid it smaller. The Man in the Shed earned himself a look by suggesting I could have measured it before I had done the whole square and made it the right size in the first place. He’s right really but don’t tell him or he will be smug about it. The only other exciting news I can think of is that my mending and sewing pile has reached the critical mass where I decided I really should do something about it. At the moment it consists of a sleeping bag with a ripped seam, a pair of Small’s shorts with a hole in the bum, one of Tiny’s skirts which looks like it has been through a shredder (I’m not really sure it is mendable, maybe a patch will have to do), a hermit crab which I can see nothing wrong with but apparently is coming apart at the seams and has holes in, and a pile of Scout badges. A couple of them are Small’s and the rest are mine – having sent me on my training weekend to make my Gilwell woggle our group remembered that they ought to invest me and give me a scarf to put in the woggle and some badges to sew on. So now I’ve told you I am going to do the mending pile, I’ll have to get on and do it, won’t I? Trying to find lots of things not to do. We never do have the time. Nothing very much has happened this week. Small’s clarinet has progressed / regressed / digressed (choose a suitable verb) from Jingle Bells to Merrily We Roll Along with occasional bursts of Oh When the Saints (under protest) which if not more exciting are at least more seasonally appropriate and we’ve all been pootling about and slowly getting back into the term time routine. It’s an eleven week term this time, I think that might be a killer for us from the northern hemisphere who think eight weeks is a bit extreme! The squares are slowly getting bigger, I have enlarged three quarters of them now, the pile on the right is the ones I have left to do. I think I am secretly just putting off the point where I have to join them together because the join in the pattern is a bit awkward. I could just do a different join but that would be cheating, wouldn’t it? I am looking at my pile of yarn and wondering whether I worked out the amounts I need properly, one of the colours that is finished now has a pleasingly small amount left over although it was a bit nerve-wracking while I was using it – I had to keep stopping to weigh the yarn and counting the squares left that needed that colour to see if I had done my calculations properly. Things to be thankful for number two: The weather here means you can dry your washing (including big thick blankets, sleeping bags and children who fall in the sea) in hours rather than days and it is very good for blocking yarny things quickly. I finished Tiny’s blanket this morning and I am hopeful that it will be dry by bedtime. 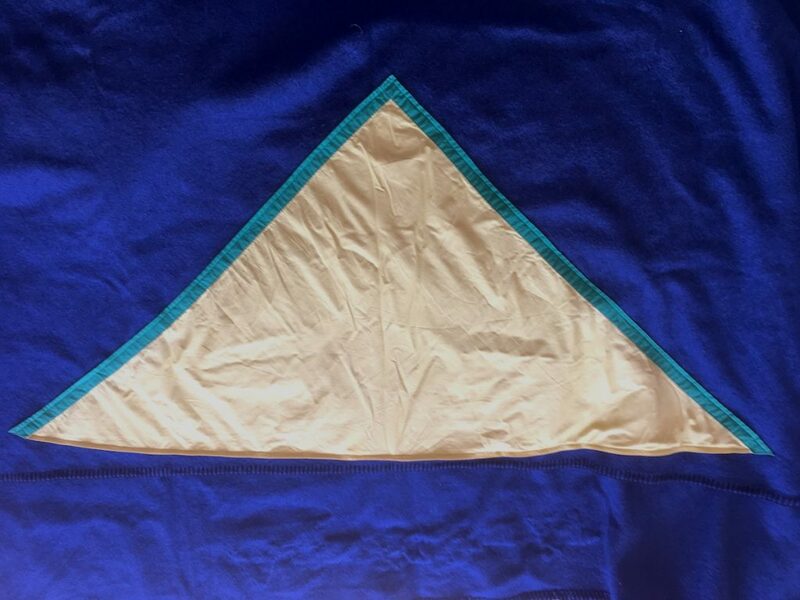 The customer requested very firmly that the colours in the border should not go in the order stated in the pattern but in rainbow order with red on the outside and indigo in the middle. 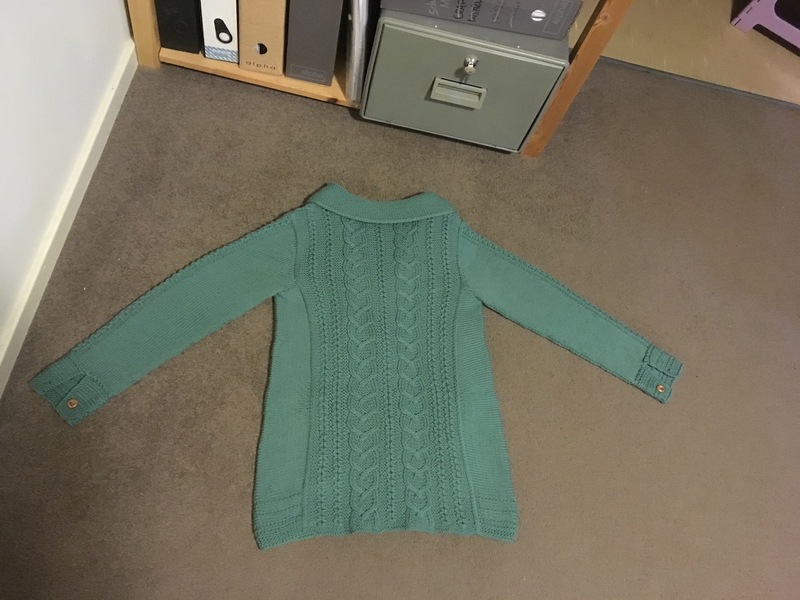 I explained that this would not quite be possible and we have settled for as close to rainbow order as we can get with ‘raspberry’ on the outside and ‘heather’ on the middle, it’s a bit heavy in the green section but I think it has more or less the desired effect. 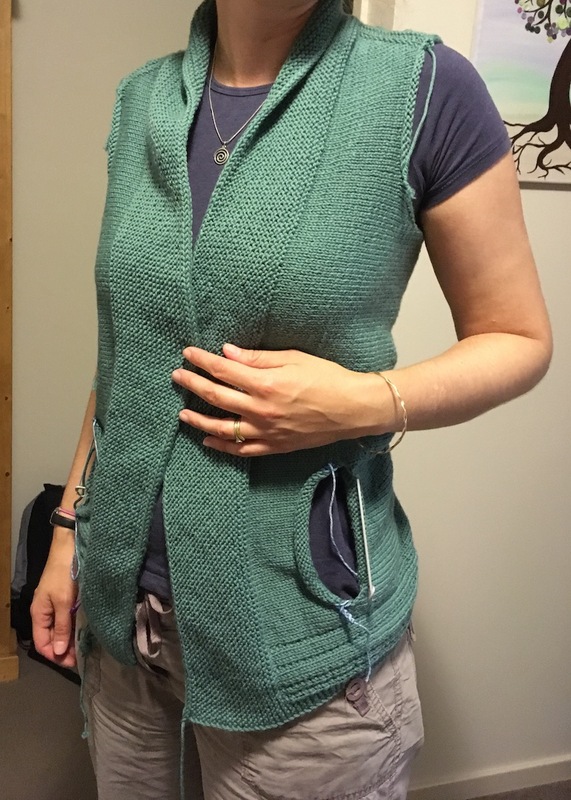 Here is the knitting I promised to show you next time. My tension square came out exactly right first time on the size of needles listed in the pattern so I am a bit suspicious because that never happens and my tension squares always lie, I am not convinced that I won’t turn round one day and measure the cardigan and find out it is three times the size it should be. So far so good though. 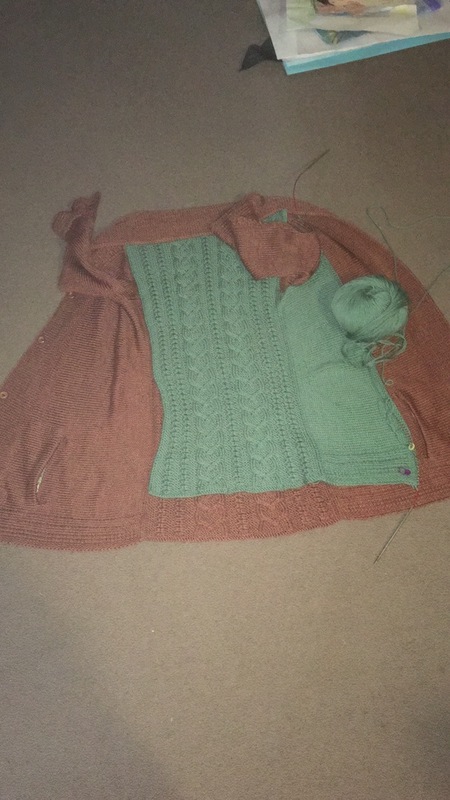 It is going to be a Luella cardigan by Suzie Sparkles, it’s quite slow because it is 4 ply yarn but it’s going a bit quicker now I have divided for the sleeves and don’t have 340 stitches to deal with. 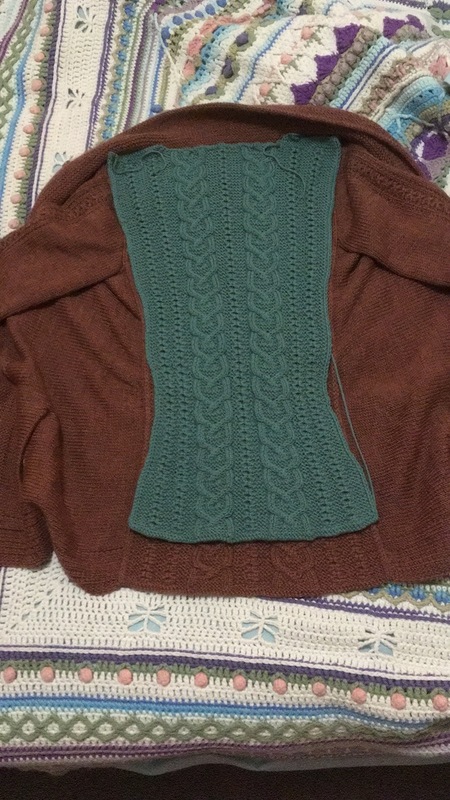 It has got a lace pattern on the yoke and is knit top down all in one piece, you go back and pick up the stitches for the sleeves later. It has got instructions for different length sleeves and pockets if you want them. I have a thing about pockets, my favourite dress is the one with pockets and I have been known to buy men’s pyjamas just for the pockets. 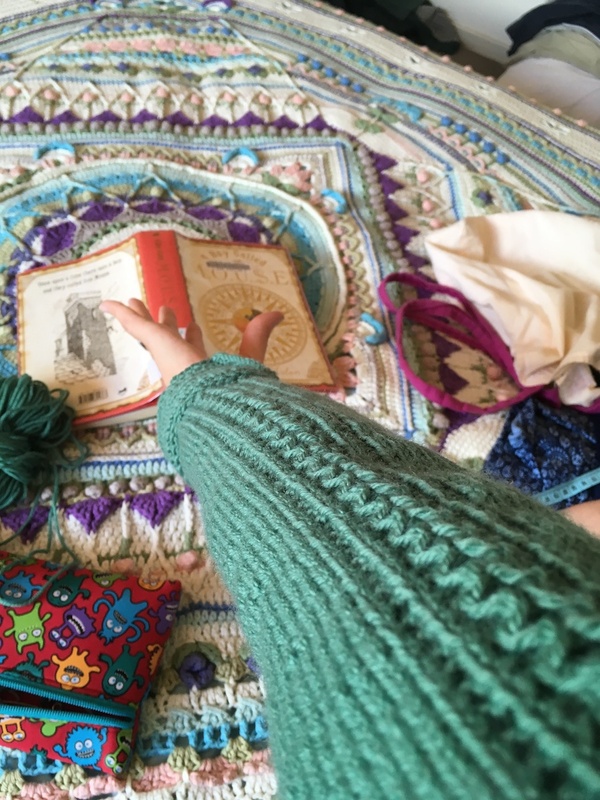 I like to have somewhere to shove my hands when I’m slouching along and to keep my useful bit of string, an interesting stone, a snotty tissue or two to mess up the load of washing and sometimes even knitting in (when it is small knitting and big pockets). I’m a bit ambivalent about the written pattern though, the lace part is written out very clearly but the rest of it could do with a bit more work, I don’t much like instructions like ‘Increase 13 stitches evenly along row’, whilst I am perfectly capable of working it out I sort of expect designers to do that bit for you especially if you are paying for the pattern. It is pretty though and it has pockets, did I mention that? The pattern also doesn’t tell you the finished length and I normally add a couple of inches to things because of having a long back or a ‘low slung bum’, as my mum refers to it, (I think I have just got my body settings on a different aspect ratio to the one people use to design clothes) so I have been reading the pattern very slowly and scribbling numbers all way down the side to work out how many rows it has and how long it should turn out (assuming my tension square is not trying to deceive me) and where I could get away with adding a few rows without messing up the pockets. 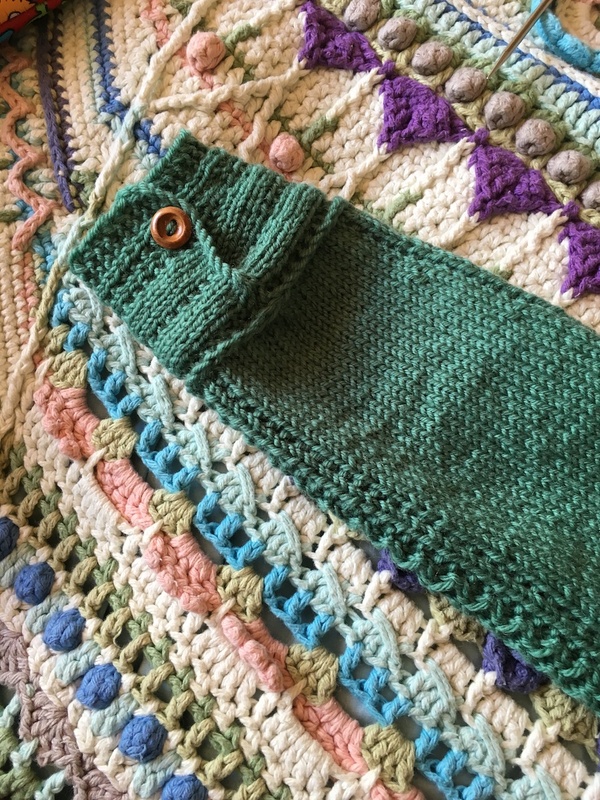 It is one of those patterns that give you a load of instructions and then says ‘At the same time…’ and proceeds to give you a load more instructions so you have to remember which row you are up to with both lots of stuff. It usually involves lots of scribbled notes, swearing and unpicking the last seventeen rows to go back and put in the increase that you missed and wouldn’t, cosmically speaking, really matter if you left out but pride is at stake and it would be one stitch wider on the left than on the right and you would know, all the time you were wearing it that it wasn’t quite right. But it does have nice pockets and beautiful lace. I’m sure the best bit is the pockets. Or maybe the lace, I quite like that too. I think there is a bit of a wobble near the end to do with how long it is by the time you reach the eleventh buttonhole but I think if you follow the instruction about the number of buttons and ignore the one about the length then it will end up being an inch or two longer than intended and with slightly deeper pockets so that suits me fine! Here is a post to show you the rest of the squares, I was really hoping it would serendipitously turn out to be a square numbered post but it was not to be. There isn’t much else to say about squares apart from here they are so I thought I would witter a little bit about some other stuff in between in case you are fed up of looking at squares. This week I have mostly been listening to Jingle Bells (played somewhat inexpertly but improving rapidly) on the clarinet. Normally that would drive me insane what with it being only February and having a tendency to acquire earworms but when it is Small playing somehow it just makes me grin and turn into that really annoying parent who tells everyone how wonderful their child is. I think it is because I have been trying to get him to learn an instrument for years, we did a little bit of piano but it doesn’t really work when your mother is your teacher. I think he finally agreed to have lessons at school chiefly to shut me up about it but so far (one week in!) he is really enjoying it and I love hearing him play something he has worked out from the music himself even if it is not very seasonal. In an effort to try and sort out the chronic grumpiness before it becomes terminal I thought maybe I should try to think of some things that I am grateful for or that are positive about being here so as a brief interlude from the squares here is the view from the rock pool (translation for the people at home – a swimming pool made of sea near some rocks, not a rock pool full of crabs and seaweed and small children with fishing nets) that is walking distance from school where I can sit with my knitting or a book and throw the children in to play, (I have even been known to get in myself on special occasions) and is somewhere that I can’t imagine ever going after school at home. 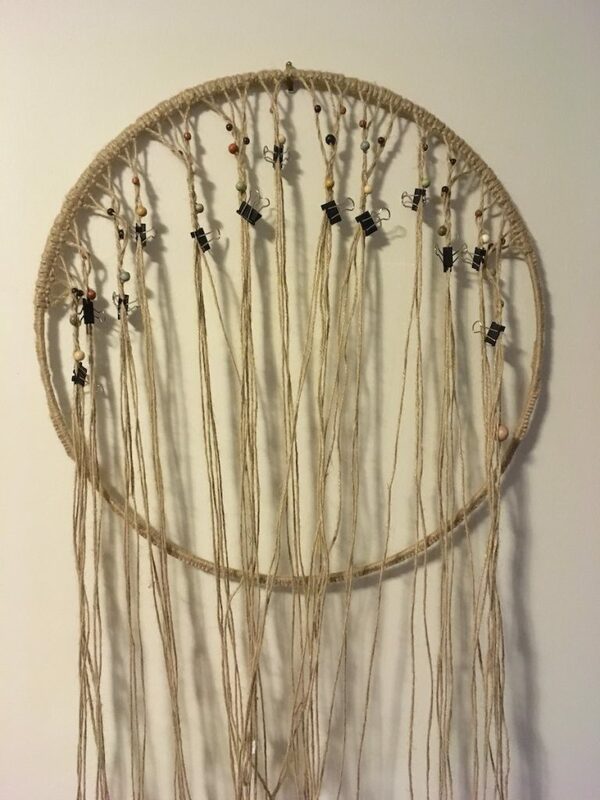 There are only two of Cat’s Claw, I thought about making a third one to get thirty-six squares but it was probably the least interesting one to make because you have to do a big plain square for the middle and then do the claw bits over the top afterwards so I decided to do something different for my extra one. 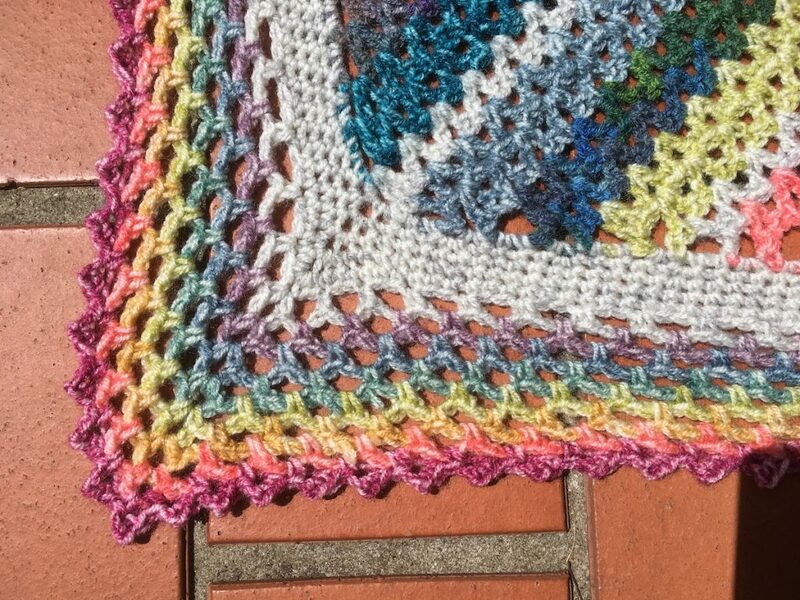 These are the odd squares, I’m glad there was only one Tropical Delight because it was really fiddly, I had to keep rewinding Hercule Poirot in my headphones because I missed a bit while I was reading the instructions, I do like the spiralling petals near the middle though. 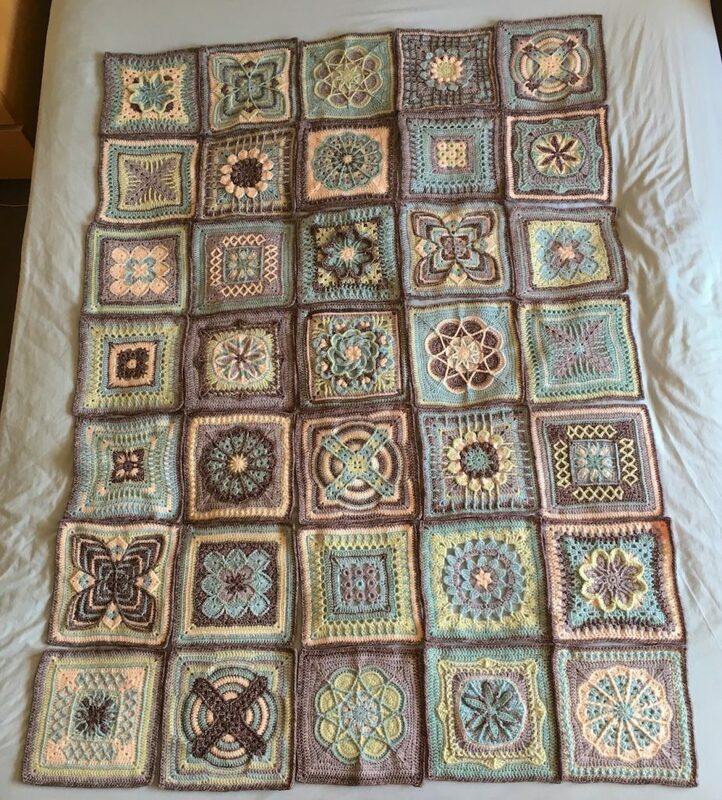 Eternal Braid is not in the original instructions but I wanted to add an extra square to make the blanket a square, 6×6 overall instead of a rectangle, 5×7. It looks a bit like an eye, it’s not meant to particularly in the pattern but I’ve been reading A Series of Unfortunate Events with Tiny and kept thinking about the VFD eyes so the colours sort of came out in that order. This is the suggested layout of the thirty-five squares. 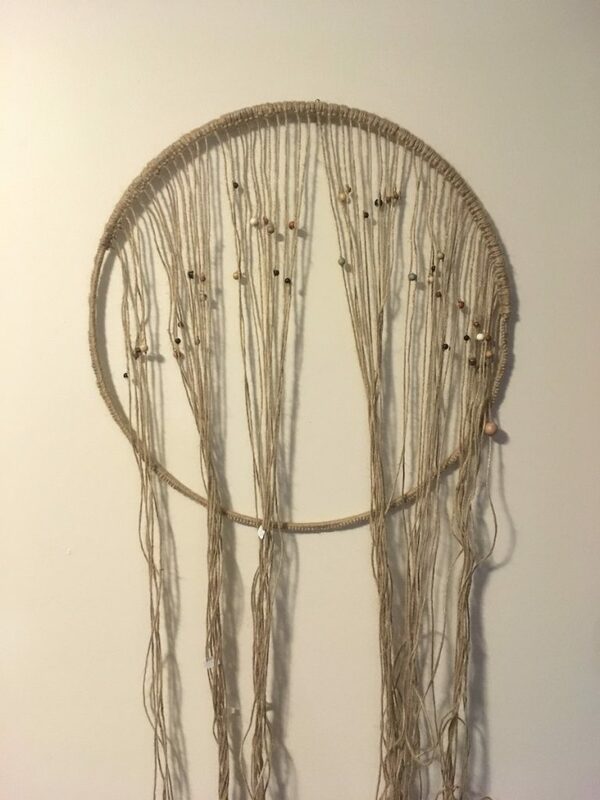 I have been messing around with them and they definitely fit the bed better with thirty-six but I also realised I will probably have to do a couple of extra rounds on each one to make it fit properly otherwise it will be a little bit short of the right size. I spread them all out on the floor and proceeded to try to do an insane sudoku kind of thing where the rules are arbitrarily defined and also a bit fluid – I didn’t want any in the same row or column that are the same pattern and I didn’t want any next to each other that are too similar in colour. This is what I finally came up with. I put the four odd squares in the middle (that is why I needed an extra one instead of another Cat’s Claw) and then listed the others as more-or-less-round, approximately-square and vaguely-X-shaped, the X-shaped category is the loosest one because I need to borrow one from each of the other categories to make up the numbers. They are in diagonal rows by category, except for the ones in the middle and except for the two I borrowed which are on two of the corners. I think I have managed to follow the rules about rows and columns. I know the Cat’s Claws are diagonally opposite the other way but I couldn’t make it work otherwise. Oh bum, I have just noticed that some of the other X-shaped ones are in the same diagonal row where they shouldn’t be. I’ll have to swap those! In other news, Tiny’s blanket is coming along nicely, I’m having the same sort of thing imposing rules on myself about the colours for the squares in this one even though they are supposed to be random. She loves it and keeps stealing it to play with which makes it a bit hard to carry on with. 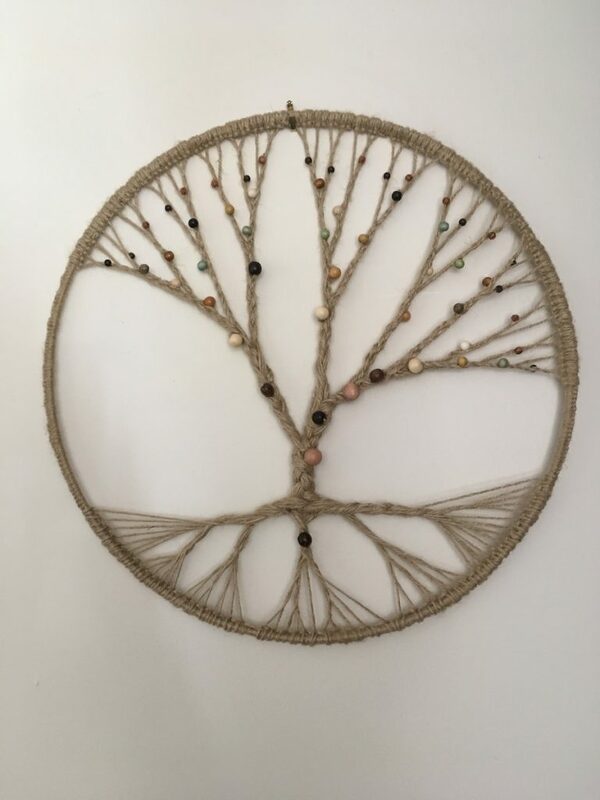 You can see from the selection of her artwork that is pinned to the end of my shelves why this particular pattern appealed to me to make for her. She does occasionally draw other things but I like these ones, they are nice and bright and remind me that God is watching out for us. I told you before that I had trouble with startitis. I didn’t have any knitting on the go (except for a pair of socks but they don’t count and a couple of things that are hibernating and I will finish some time, they don’t count either) and this yarn was my birthday present last year which I have been itching to get going with, I will tell you about it properly next time. I managed to wait at least until I had finished the squares, I am pretending that doing the extra rounds and joining them all up and the border don’t count so that I am allowed to start a new thing, I mean the whole blanket is practically done, isn’t it? 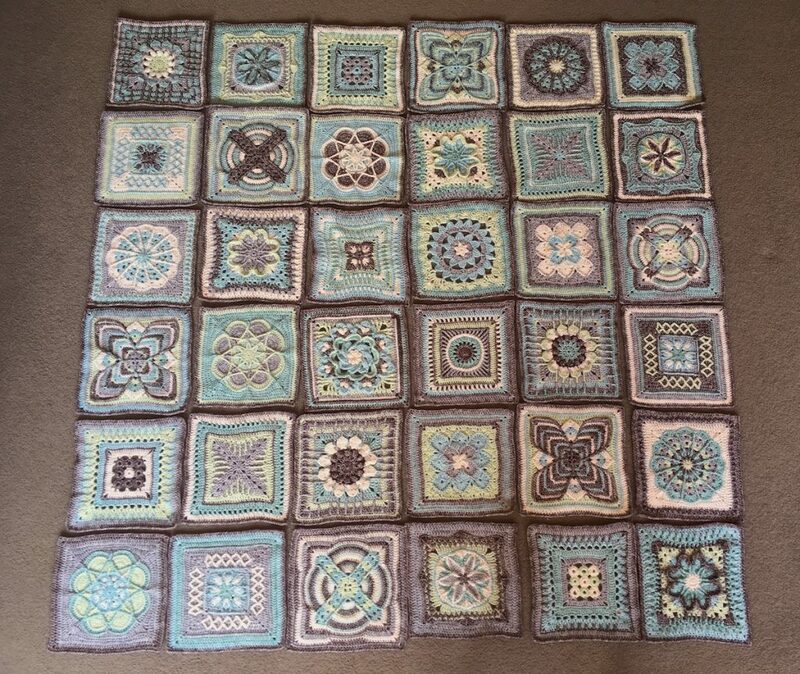 I’ve been making squares for a while, Esther Dijkstra published a ‘crochet along’ last year on her blog for a blanket called Nuts About Squares which I fancied making. 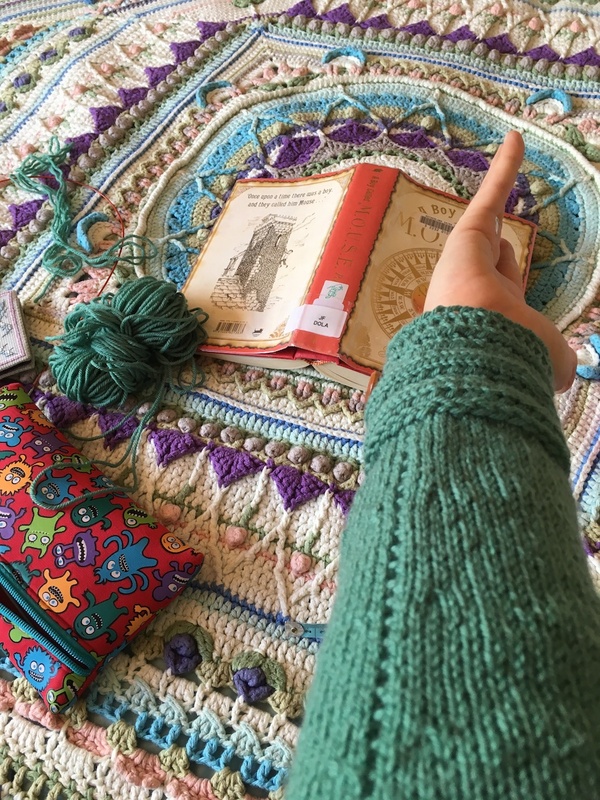 I started it in the autumn spring (oops, I don’t know what time of year it is anymore) and then got side tracked with Christmas stockings before I got round to writing anything about it. 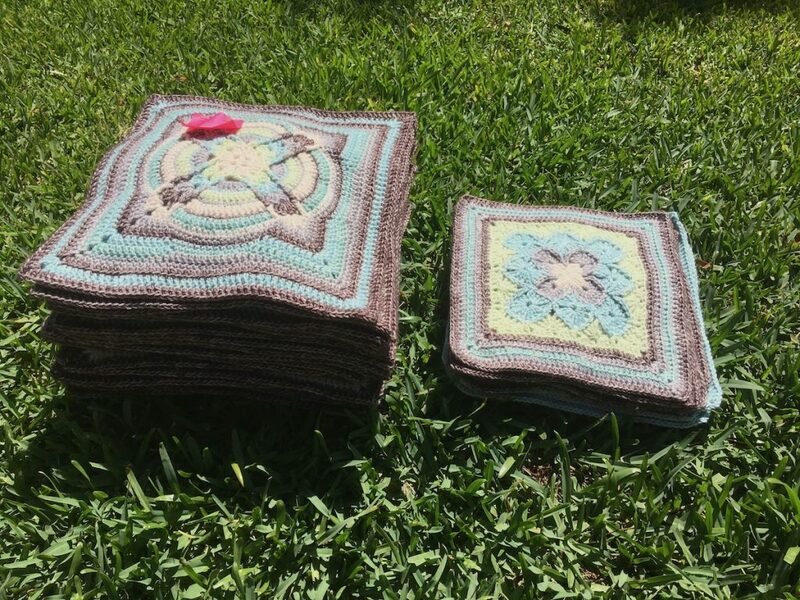 It’s a great pattern – she has collected a load of 12″ square patterns from different designers who agreed to be part of it and put them together to make a big blanket, she has made all the squares up to the same number of stitches so you can join them easily and published yardage for different weights of yarn and for a border and it’s lovely. 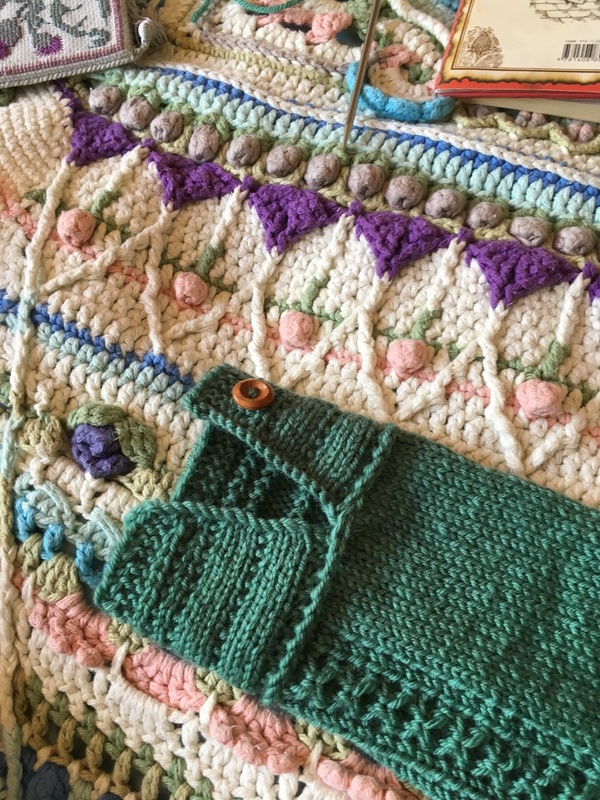 All of the squares are a little bit unusual or interesting to make so it’s has been really fun working through them, some of them are slightly fiddly and some just use common stitches in a particular combination to make shapes that look a bit different. 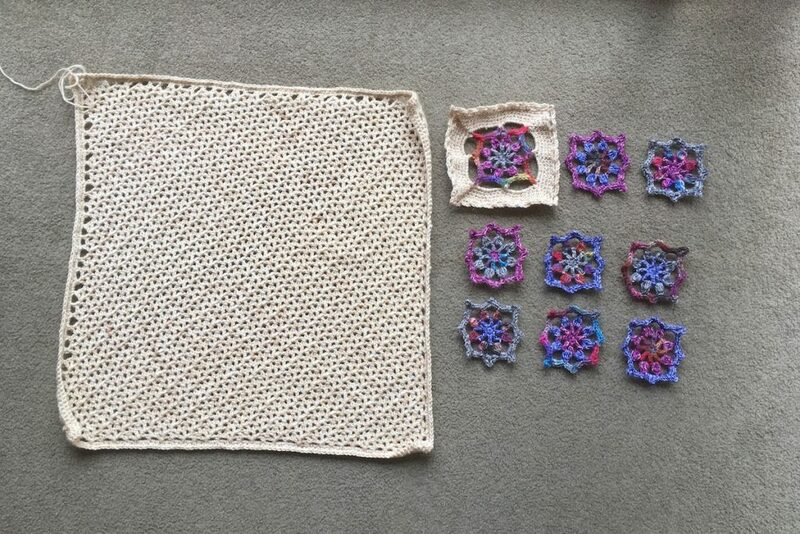 There are three of most of the squares in different colour combinations so you can get the hang of a pattern without getting bored of having to make thirty five of them (it is five squares by seven) although I am considering making thirty six because why would you call a blanket Nuts About Squares and then have an almost square number of squares? Also if it is six by six and the whole blanket is square then it will fit better on the bed. 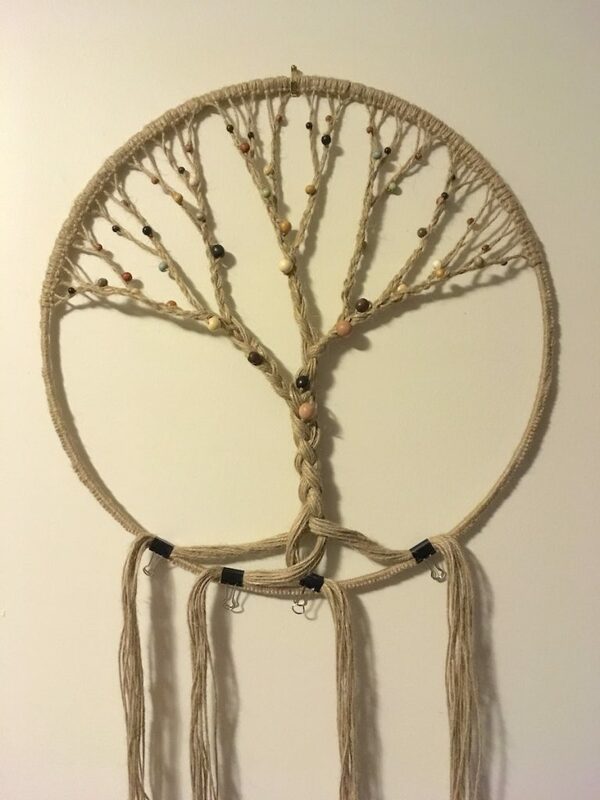 The instructions use six colours, I didn’t use the ones she suggested because I didn’t really like the brown so I picked a main colour that was closer to grey. I’m not too sure about it but by the time there is a whole blanket of it, it will look like it is meant to be there. I tried explaining to Man in the Shed about how lovely all the squares are and how clever the designs are and what is special about them all but he just said something along the lines of “Yes, Dear” and wants to know why am making another blanket but he has been hiding in the garage (he doesn’t have a shed at the moment but the Man in the Garage doesn’t sound so good and you might think I had swapped him for a different one!) to make a Scalextric lap counter thingy with a big seven segment LED display that he can control with a Raspberry Pi even though he already has a perfectly good lap counter where you can set the number of laps and it beeps at you when you have finished and tells you your best time and everything so I think we are quits now. I haven’t quite finished all the squares yet, I’ve got a couple more to do before I show you the rest but here is another thing. I have always had a bit of trouble with startitis but I am generally a lot better at finishing things off than I used to be. 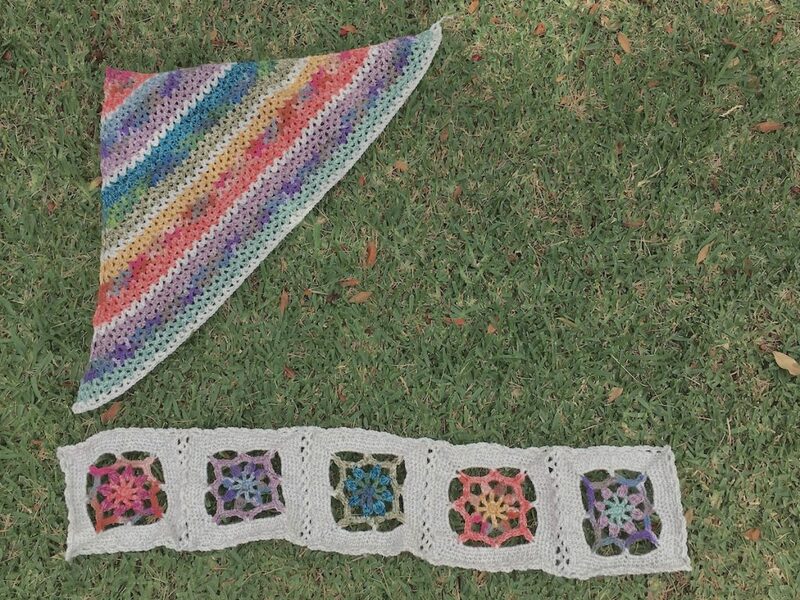 This is going to be a blanket for Tiny to go on her bed, it is a Stylecraft pattern. I’m am struggling with it a little bit because when I bought it I thought that the order of the stripes repeated and it doesn’t, there is a sequence in that the middle colours of each stripe repeat but the outer ones change each time and the instructions for the motifs in the centre of the squares tell you to use random colours but my brain won’t let me do that so I am using the three colours from each stripe to make a motif that matches it which also means it makes it less monotonous to alternate the stripes with the squares. Tiny doesn’t have an issue with the colours being random, I have instilled a good appreciation of pretty rainbow order colours in her but most of the time she just throws anything she likes together so she is very pleased with it and keeps telling me to get on with the her big square instead of my little ones. Yes, Miss! I’m going back to work now! As previously mentioned I’m not that good at making the same thing more than once, the second one goes slower and slower and quite often stalls. I am an advocate of the two-at-a-time sock method for this very reason. People sometimes say I should make things to sell but aside from the time-spent to price-that-people-would-pay ratio being an issue there is the problem that I find it really boring to repeat things (although for some reason squares for blankets don’t seem to fall into this category but don’t ask me why!) and for me the point of making stuff is to enjoy the making not to be a machine churning out lots of the same thing. 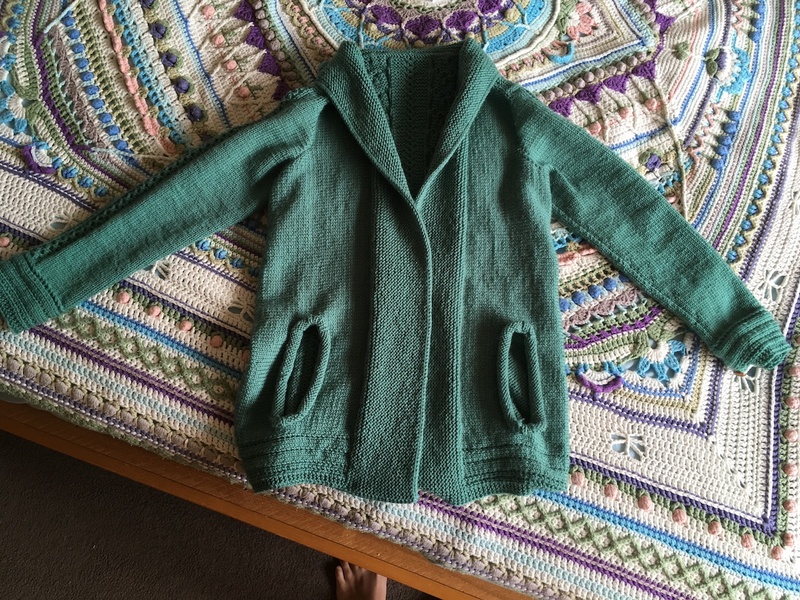 So when my mum asked me to make a cardigan for her the same as one of mine my heart sank, just a teeny bit, not very many people could get away with asking that but she’s my mum so she is one of the ones who can. She wanted it to be the same size too which also filled me with dread a little bit. 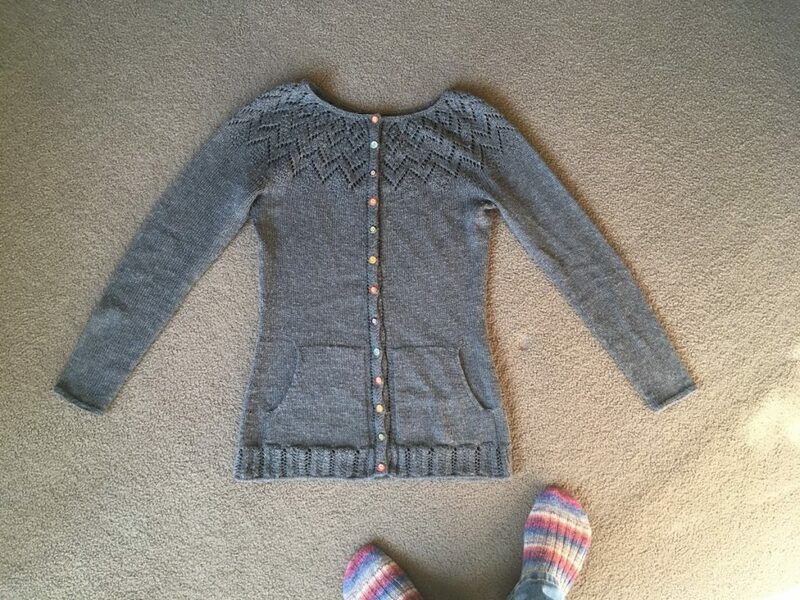 I’m never great at getting the tension right on things, I’ve just got better at admitting when something isn’t going to fit and ripping out to start again and when I made the original cardigan I started it then realised the tension was not quite right, was too lazy to start again and decided to knit the 36 instead of the 34 because the drape of the fabric was ok and it turned out perfectly (it is my favourite cardigan, I wear it when I am nervous and have to look a bit smart or when I am pottering around in my jeans or over the top of my pyjamas sometimes and most of the time really) so the chances of duplicating this feat seemed pretty slim. Plus I didn’t write down what size needles I used in the end because I wasn’t expecting to make another one! 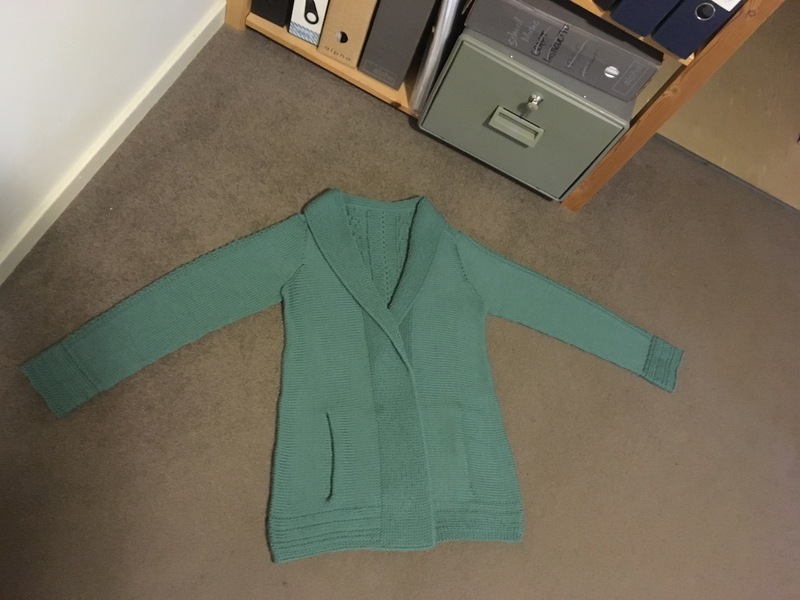 But she is my mum so I organised the wool with her, measured her very carefully and worked out she is not as tall as me so to leave out the extra length I had added into mine and that she is always cold so she might like long sleeves and said I would give it a go but it might take me a while. I managed to knit the whole thing whilst guiltily thinking I should take some proper pictures for the blog and then ploughed on with knitting it anyway because I was enjoying it so much so these are pictures that I took quickly on my phone just to send my mum some proof that I was really knitting it and not getting distracted with my squares. The pattern is Ysolda’s Pumkin Ale which has a really unusual construction and Ysolda is one of my favourite designers so maybe that is why I managed to knit it all without flagging, her patterns are always fun to make and the little details like the i-cord bind off on the edge and the way the cuff is joined on make them look really professional and I love it when there is no sewing up to do. 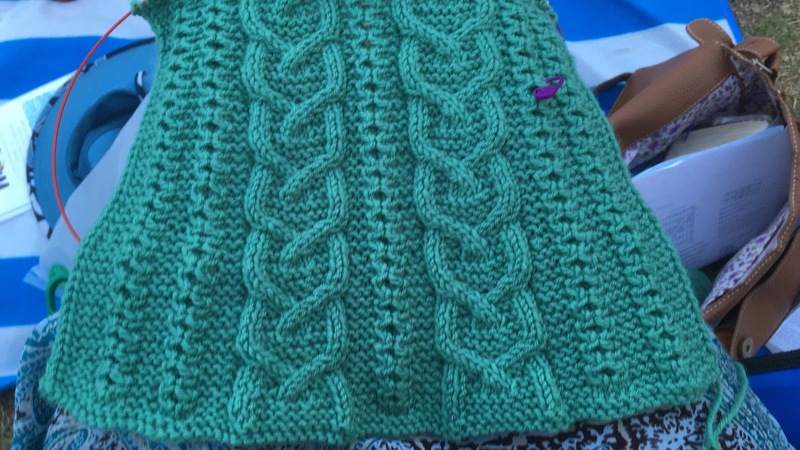 When I wear mine I occasionally get a random knitter sidle up to me and say, ‘Did you knit that? It’s an unusual/interesting/beautiful/insert adjective of choice here pattern’ or ask me how the pattern works. UPDATE: Also I just noticed if you are viewing it in an RSS feed thingy then the descriptions might not show up so have a look on the website instead, there should be a sentence or two to go with each photo but I don’t care enough to try and make it work properly any more! while the stockings were drying off. and I took it to the open air carol service/BBQ. 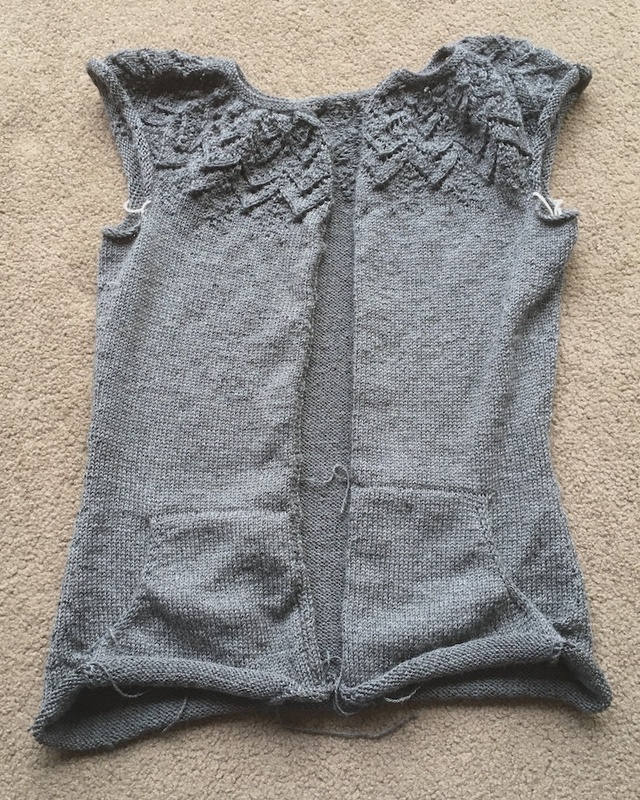 and knit the sides perpendicular to the back. and the border for most of the drive back again. 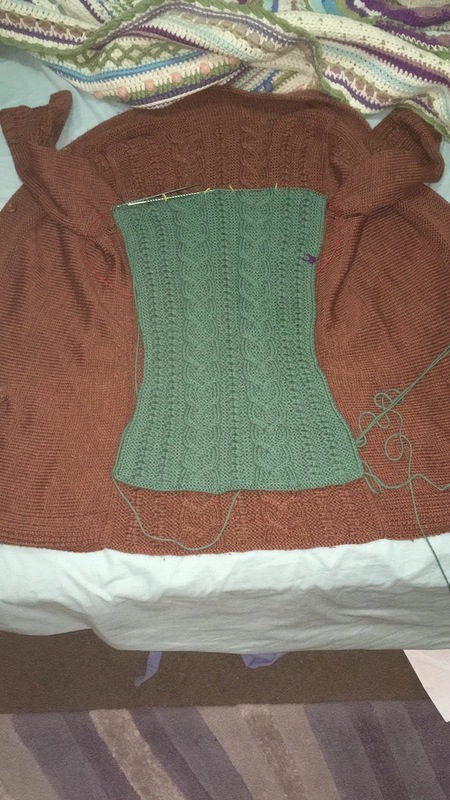 The back panel has got nice waist shaping. Please excuse the model. 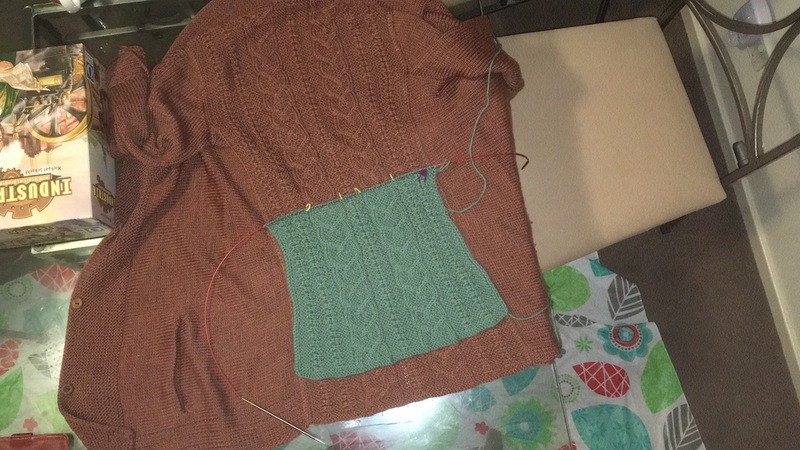 You pick up the stitches around the armhole for the sleeves. That is a good book, by the way. It was a bit like David Copperfield for nine year olds so just about my level. 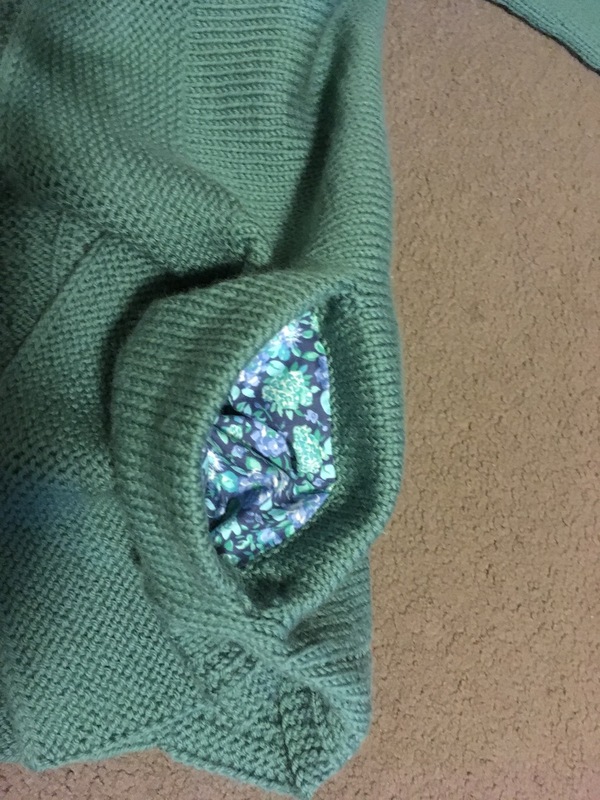 I adapted the pattern to make full length sleeves and added a button to to the cuff. 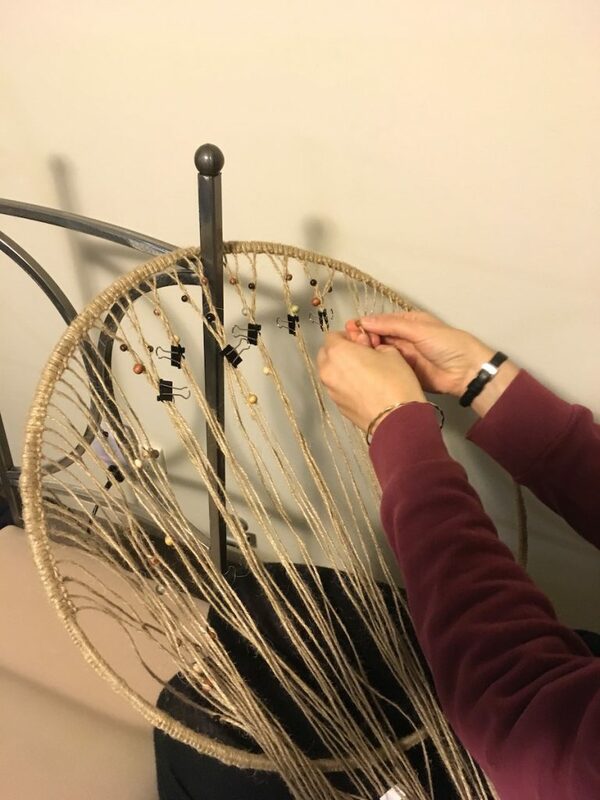 The cuff is knit back and forth across 16 stitches and you join it to the sleeve as you go which make a really neat bit like a braid at the join.